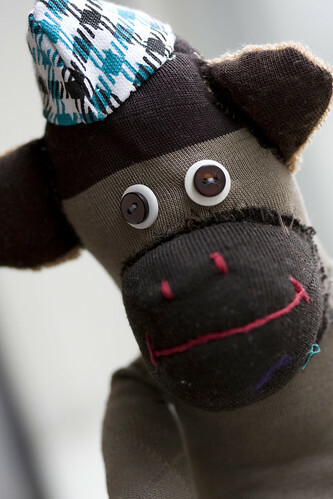 The sock monkey has a long history as a popular children’s toy in North America. The design ingeniously transforms a pair of socks, a pair of buttons, stuffing and thread into a lovable creature. Traditionally, the red-heeled work sock has been the most popular choice for sock monkeys. The red heel forms the distinctive mouth on the stuffed monkeys. But nowadays the monkeys come in all sock varieties, each one cute and ready for some monkey fun. Lindsey Hodgson believes in the power of these monkeys to make a difference. 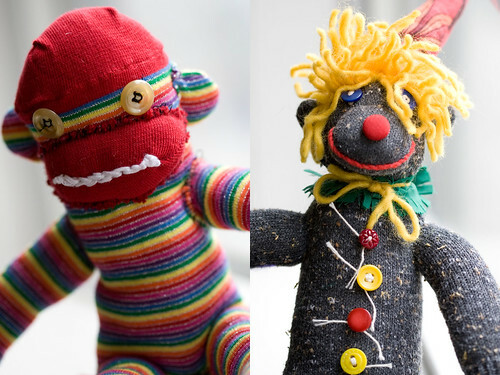 She started up Operation Sock Monkey to create awareness for Clowns without Borders and to send sock monkey ambassadors to children affected by AIDS/HIV in South Africa. How was Operation Sock Monkey born? Lindsey: Operation Sock Monkey (OSM) was born from a love of sock monkeys and a belief in their healing powers on the human soul. No matter who you are or what you do, a sock monkey will cheer you up when you’re feeling blue! Lindsey: Can you imagine losing your most or all of your family to an epidemic? Who would be left to ask you what you want to be when you grow up? Who would sing songs with you and make you smile? Who would let you know that you are loved? I believe that the work that Clowns Without Borders does is vital in the the healing process of those bereaved by or infected with HIV/AIDS. Daily life is often a struggle when faced with challenges meeting very basic human needs, such as food shortages and drought, on top of having or living with someone who has this debilitating virus. The clowns provide much needed comic relief and emotional support in the form of shows and workshops. Sometimes they also provide food and other resources to the communities they work in. They are bringing extreme positivity to a very negative situation and the response they are met with is astounding! I am delighted to fundraise for them through sock monkey sales and sponsorships. And I’m absolutely floored at how many others have lent their energy, creativity and resources to OSM. How many monkeys have you been able to donate so far? Approximately 150 monkeys have been sent via clown-courier to HIV/AIDs orphans living in South Africa. More than half of those were sewn by volunteers who have donated their time and talents to the cause. It’s really inspiring to be moved by a project happening around the world, and then do something about it here at home, and to have others join in and say – ‘Hey! we want to help too!’ It brings a sense of of global community and citizenship that seems so difficult to attain in this big crazy world. Small acts of love can make a huge difference. Why do you think everyone loves sock monkeys? The sock monkey is a magical creature who lives for many human lifetimes. Their very nature is Reincarnative. Some will have 5, 6, 7 owners. Imagine the stories they could tell, the things they have seen, the feet they have warmed! Humans can sense the innate wisdom and omnipotence of these marvelous beings and are easily enchanted by them. Lindsey & Operation Sock Monkey will be at the Kids Trunk Show at the workroom, 1340 Queen Street West, on Sunday August 17 from 12-5pm. Show your support for this worthy cause and purchase a sock monkey or three. If you’d like to learn to make your own sock monkey you can join a workshop taking place next door to the Kids Trunk Show at Shop Girls, 1342 Queen Street West, on Sunday August 17 starting at 1pm. The cost of the workshop is only $15 or free if you donate your monkey to Operation Sock Monkey. All materials and supplies will be provided. All ages are welcome and youngsters are encouraged to bring along an adult to partner with. Sock monkeys can be purchased anytime from the Operation Sock Monkey website. Monetary donations or even material donations of new socks or stuffing are accepted, as well. It seems to be that you are having so much fun. I always get your newsletter. I didn’t know that you have guest instructors? very sweet… thanks for posting this. i have a ton of parts around here that i’d love to donate to something like this.